With its focus on the “old-fashioned” theme of nature — flowers, palm trees, rolling hills and rainstorms — Into the Wild, curated by Carol Jazzar, stands out in an exhibition landscape regularly dominated by conceptually based art. That’s especially true as South Florida ramps up for Art Basel’s onslaught of the hippest and most collectible offerings. But, the theme of nature — specifically environmental controversy — clearly has currency. It’s a recurring topic for political cartoonists, presidential debate and letters to the editor. It’s also currently addressed by other artists around town: Jim Couper at the Frost Art Museum, Xavier Cortada in Clima at Hialeah’s Milander Center for Arts and Entertainment and Robert Huff at Miami Dade College’s Museum of Art and Design, to name three. Jazzar was raised in France’s Brittany region, and she recently described the giant oak tree behind her childhood house as a sanctuary from the normal conflicts of growing up. After moving to the United States more than 20 years ago, she purchased a home in El Portal, just north of the city of Miami, that was especially appealing for its spacious yard, lush with subtropical foliage and fruit trees. In a pioneering venture, she operated a highly respected gallery in her home and a converted garage, until early this year. Although the art she presented included every imaginable form, technique and theme, the connection between the creative spirit and the sensual stimulation of the natural world that enveloped her exhibition venue was vital. Take a breath and smell the different fragrances. Listen to the rickets — and occasional mosquitoes, she coaxed a visitor. 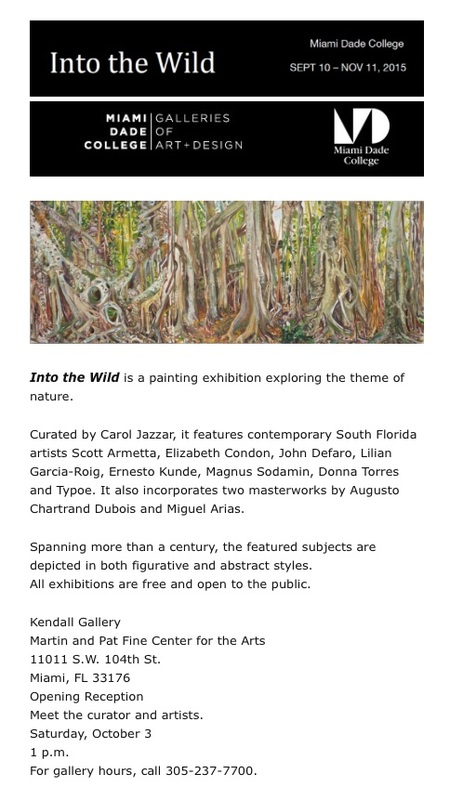 “We are in the heart of the city, but still it’s like being in the country.” The large, high-ceilinged and chilly white space of Miami Dade College’s Kendall Campus Gallery is a far cry from the intimacy of Jazzar’s El Portal garden, but the 19 artworks by 10 artists generate sanctuary from the surrounding concrete and commotion. Jazzar has been a longtime fan of Lilian Garcia-Roig. “She’s a plein-air painter, so she goes into the woods early in the morning and spends the entire day there. She depicts what she sees, and it’s really lush and fuzzy and wild,and you can see it in her painting,” Jazzar said. “She uses a lot of paint. It’s both abstract and figurative work. Because when you’re up close, it’s only big blocks of paint on the canvas. Her canvases are really thick, really charged with paint; it’s only when you look back that you can see, ‘Oh yes, it’s a forest, or it’s the Everglades.’ ” Sodamin’s poured paint generates marbling effects in a meandering flow that suggest depths of possibly toxic water, from which myriad blooms emerge, all clamoring for attention. Few appear freshly picked. As Jazzar said, “They’re almost like decomposing on the canvas.” But look for the incongruous insertion of an apple, hiding in plain sight about seven feet off the floor. Edible?